Ealing Borough Police introduced a Dispersal Order in the Hanger Hill Ward on August 23rd. 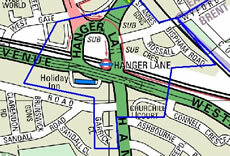 This dispersal order was introduced specifically to combat the issue of Windscreen Washers in the Hanger Lane Gyratory Area and will be primarily enforced by the Hanger Hill Safer Neighbourhood Team - 020 8721 2947. The area covered by this dispersal order does not cover the junction of Old Oak Common Road and the A40 (Savoy Circus). The junction of Old Oak Common Road and A40 is covered by the East Acton Safer Neighbourhood Team - 020 8721 2708. They are working with partner agencies and neighbouring safer neighbourhoods teams on Hammersmith and Fulham Borough for a long term solution to the situation. In the mean time they will continue to patrol the area to deter this practice. During a discussion about this earlier this summer on the ActonW3.com Forum, Sara Nathan advised those bothered by unwanted windscreen washers to turn on their windscreen wipers. Charles Gallichan, Chairman of the Ealing Community & Police Consultative Group also gave Forum users some advice: "If you are a 'victim' of this problem, please do call the Ealing Community & Police Consultative Offices. We will 'log' your name and contact details and pass them on for you. We are a voluntary group, with limited office hours, 10 -3 weekdays, but the more witnesses that can be gathered the better. "The tel number is 020 8896 0925. "We don't want calls that simply tell us you saw them doing it, we need those who have had demands for money or threating behaviour." He asks people not to use the above number to report other crimes.